My relationship to raw food started about a year ago after I saw this guy on TV, who runs a raw kitchen/ cafe in Fremantle. He was showing how to make a dehydrated bread and zucchini pasta, etc. I thought it would be one of those fad diet thing, but found out after a fair bit of research and studying nutrition, raw food actually provides good nutrients and vitamins to your body. Of course, certain foods I believe are better to be cooked to be absorbed into your digestion system, for example carrots and tomatoes. I’m not on a strict raw diet, but perhaps 50:50?! depending on how I feel. Sometimes I feel like a refreshing raw salad, but sometimes crave for a nice warm hearty soup. What I’m trying to say is…it is all about a balanced diet 🙂 Do whatever works for you and do not judge other people. I like the way I eat and hope other people don’t frown on me or anything. 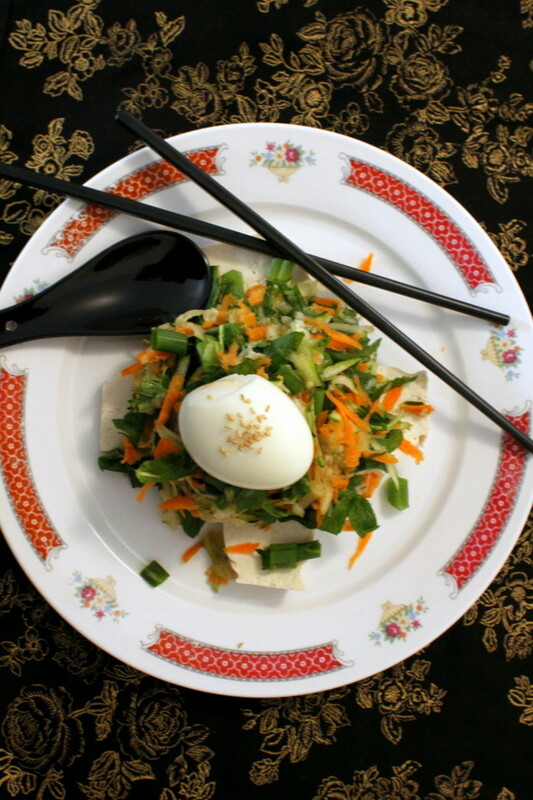 I made some Asian inspired salad for light lunch. 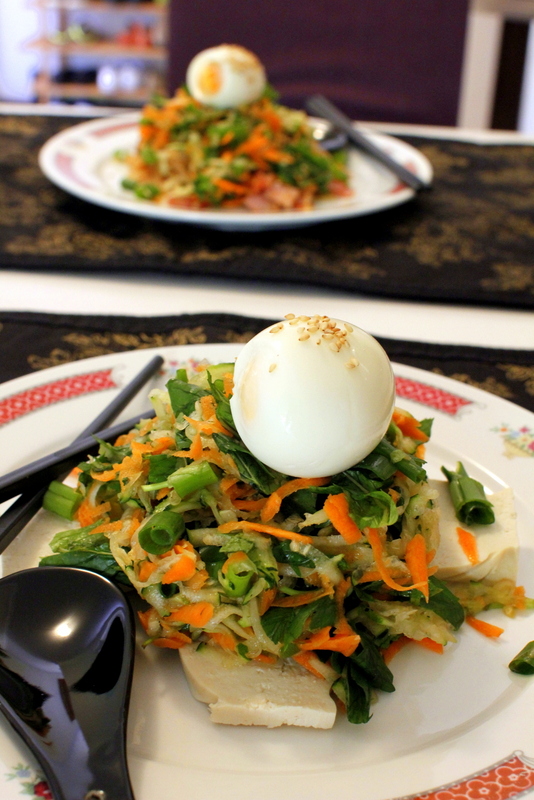 We had a soft boiled egg sitting on mixed salad and slices of firm tofu (rice noodles for Daniel). I also drizzled soy sauce, sesame oil and sesame seeds on top. It’s crunchy, refreshing, light and nutritious, and surprisingly very filling. This salad is actually a left-over from last night. I grated a half zucchini, one carrot, spring onions and mint leaves. I had it with a small bowl of mixed grains for my dinner. See how lazy I get on the weekend? 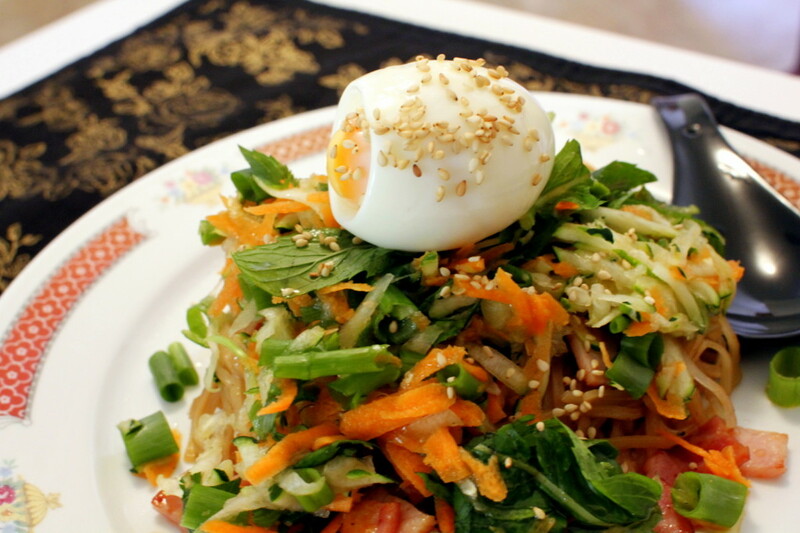 Just make a big batch of salads and have it with either noodles or rice or fish or chicken or….whatever you feel like!